Yoan Moncada clubbed another two homers Tuesday, and he’s up to .333/.371/.652 to open the season. The former top prospect is still just 23 years old and has a different approach at the plate in the early going, walking less but also cutting his strikeouts by nearly 10%, which has always been his biggest weakness. Putting more balls in play is an especially good thing when you’re hitting them as hard as Moncada, as his Barrel% (17.4) is in the top 8% of the league, and his exit velocity (96.4 mph) ranks No. 4 in MLB (and that was before his big game Tuesday). Moncada has been moved to the No. 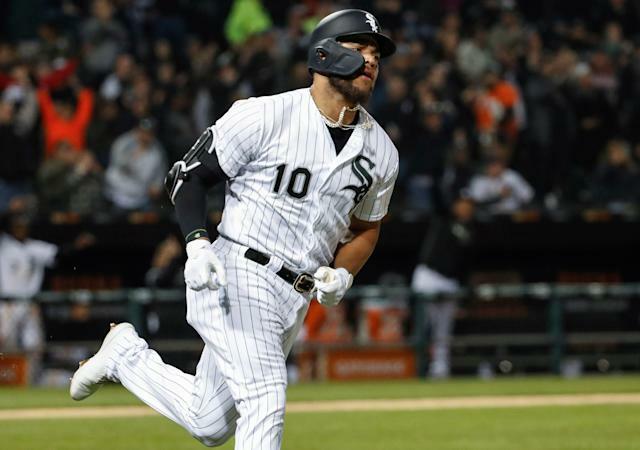 2 hole in the White Sox’s lineup, and the switch-hitter should benefit from a home park that’s friendly to homers (it’s boosted them by nine percent over the last three years). He’s plenty capable of adding 15-20 steals as well, and it’s an added bonus that he’s both 2B and 3B eligible. I wouldn’t be trying to sell high, but instead sit back and enjoy the full breakout campaign that’s clearly in store for Moncada this year. He tossed a shutout and now owns a 2.60 ERA and 0.94 WHIP on the season. Somehow though, Minor remains available in more than 80% of Yahoo league. He went yard yet again and is up to nine now (eight have come against the Cardinals). He has 10 RBI over the last two games and with a 13:11 K:BB ratio, as it appears he’s getting even better at the plate a year after winning MVP. The Cardinals starter (5.00 ERA, 1.61 WHIP) joins a long list of promising pitchers off to poor starts after getting knocked out early against the Brewers on Tuesday. Minter was rocked for three runs and took the loss after entering the ninth in a tied game before being pulled, which isn’t what fantasy owners wanted to see right after Arodys Vizcaino went to the IL. Craig Kimbrel back to Atlanta? Castillo recorded his second save of the season with Jose Alvarado setting him up, so Tampa is truly going with a closing committee. In other Rays news, the team entered 16-for-17 on SB attempts but were gunned down twice on Tuesday, as baserunners are just 4-for-10 when trying to steal against the Orioles this season. The Mets starter was annihilated for eight runs (six earned) without recording a single out, becoming just the ninth pitcher since 1908 to go zero innings and allow that many runs. Godspeed if he was in your lineup. Kingery had a big night, homering with five RBI. His OPS is up to 1.440 in limited playing time to start the year, but that could change with Jean Segura suffering a hamstring strain Tuesday. Kingery is available in 95% of leagues and would be worth an add should Segura require an IL stint. Strasburg served up three homers in a home start to the Giants after he allowed 18 long balls (second-most of his career) over just 130.0 innings last season. He entered with an average fastball velocity (93.1 mph) that was a career-low by a wide margin, so there’s reason for concern. He finally allowed an earned run for the first time this season, and he now sits with a 0.81 ERA, 0.76 WHIP and a 21:4 K:BB ratio over 22.1 innings. Too bad that’s resulted in just one win, but he’s legit (Musgrove entered allowing a .183 wOBA that ranked in the top 6% of the league). Kela blew a save opportunity but managed to pick up the win and would be a must-add in all fantasy leagues should there be anything more to Felipe Vazquez being unavailable (he threw 43 pitches Sunday). Boyd entered leading all pitchers in WAR before yet another strong outing Tuesday night. He’s the real deal. Hampson (homer and a steal), Story (three steals! ), and Arenado (homered for third straight night after failing to do so over the first 15 games) all had big games in Petco Park. The Rockies entered with an MLB-low 38 wRC+ (next lowest were the Giants at 52). After getting bombed for eight earned runs in Milwaukee, Quintana has produced an 18:1 K:BB ratio over 14.0 scoreless innings during his last two starts. Elsewhere in the Cubs, the best thing you can say about Kris Bryant’s .679 OPS is that it’s better than Anthony Rizzo’s .668. Pederson has homered in three straight games and is up to eight on the year, as he continues to destroy right-handed pitching. The reliever was activated from the IL on Tuesday, and he needs to be owned in all fantasy leagues with the Brewers’ previous handling of Josh Hader in the ninth (and Corey Knebel out for the season). It’s no sure thing Jeffress is fully healthy, but he was dominant last year (1.29 ERA 0.99 WHIP), could soon start getting saves and is available in more than 60% of leagues. The major league average OPS was .727 last year. It’s up to .740 so far this season. Put differently, last year the league ERA was 4.15 and this season it’s 4.41, and offense should continue to jump over the summer months.